Croaker especially the silver croaker is a ray finned fish that is known to inhabit the waters surrounding China and Korea in the North Pacific where is it caught commercially. In Japan, it is called guchi, which means white mouth. There are many ways to eat croakers including raw as sashimi, grilled, or fried. 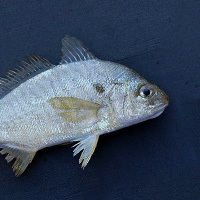 The calories in Croaker per 152g(1fish small edible part) is 126 calories. Croaker is calculated to be 83Cal per 100 grams making 80Cal equivalent to 96.39g with 27.36g of mostly protein、1.22g of fat、0g of carbohydrates in 152g while being rich in vitamins and minerals such as Vitamin B12 and Vitamin D.